I was on the hunt for a duvet and got a few options. This was nice but I ended up returning it as I was going for a different style. Can die hard when solid. 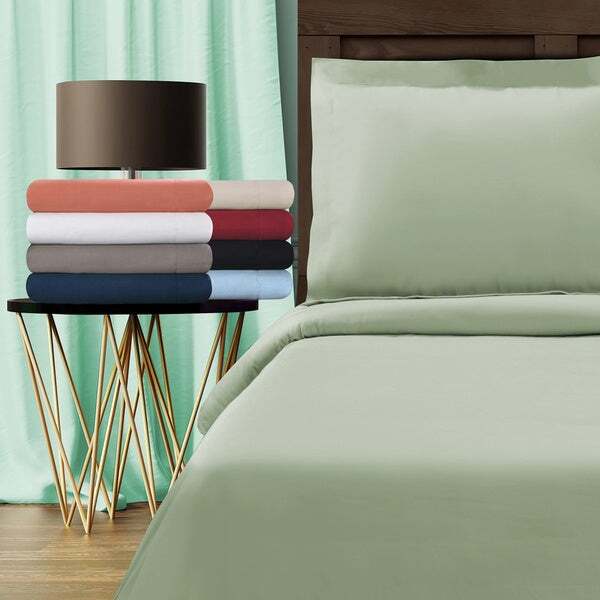 Honestly, I chose this Duvet after reading many good reviews, but for a month or so have kept it in my shopping cart since I was searching more and went to stores like Bath & Beyond to be able to touch similar thread count Duvets to find something soft. I didn't find any and decided to order this. It came fast, neatly packed, and nice white color. It is silky soft, has a mild shine that gives it a smooth soft look too, is medium thick, and has high quality. The comforter fits perfectly in it, and the duvet is not sliding but stays in place on the mattress. Some customers said negative stuff about this duvet, but I don't see anything bad or wrong about my duvet. I am surprised how soft and high quality it is. I am really happy to have found this duvet, and I would recommend it to anybody who is looking for a high cotton thread count and soft quality. I washed the set (duvet and two pillow cases) with cold water and dried low, which it didn't peel or fuzz. It came out of dryer clean, not wrinkly, and soft. It doesn't make crispy sound and is not see-through or thin. Buttons hide when you button it up. I first thought it is too expensive, but now that I received it, washed it and put it on the bed, I am so happy with it and it worths the price. Thank you overstock. This duvet cover and matching pillows are absolutely gorgeous - soft, silky material, well made. The queen is not skimpy as some are, the buttons are hidden in a plaque, the sham covers are sewn with an edge, really well made. A great buy. I ordered the blue cover and shams and they are beautiful. The quality is exceptional and the cover fits my oversize comforter well. The material is very soft and looks elegant. I originally ordered the taupe comforter, but the color was much lighter than shown in the picture; I exchanged it for the blue (which is closer to the online picture) and am very happy with it. I have had my Duvet for about 2-3 weeks now and I got to say I love it. The feel and the look of this duvet is very nice. I went with the Ivory and it was true to the color shown. My husband loves our duvet as well for awhile we were using our feather down comforter without a duvet and we hated the feathers that would fly around the room. Since we have been using the Duvet we no longer have that problem. My husband loves the cool, soft feel of our Duvet and now wants me to order the Egyptian Cotton 800 thread count sheet set as well. There are wrinkles as I previously read before but if I promptly remove the duvet from the dryer it is not bad at all. Besides that the Duvet is very plain, no design to it at all so I use a single size quilt when setting my bed that matches and just enough of the duvet shows around the sides that it looks like a nice decorative comforter. This is comfy and feels nice, a little big but overall I am ok with it. However, it is NOT sage. It is MINT GREEN. It was relatively cheap, and feels ok, so I will keep it as a spare. But if you are looking for Sage, you won't get it! The duvet cover is very nice. I expected to get a decent duvet cover for my cal-king bed, but I was suprise to get such and elegant duvet cover. It fitted into my designer bedroom and the was as if it was an oversized duvet cover which I loved. The color is rich and it feels wonderfu. The material is just what I was looking to find at the other stores, but the price in the store was absolutely, too high priced for me to buy. I didn't put anything into the duvet to make it any heaveier, yet, because it is too hot in California at this time. I know that it is going to be great when it is cooler. Thank you overstock.com, I will use you first. Overall I am very happy with this duvet cover. I purchased it in white. It does indeed get softer each time you wash it, and yes it does wrinkle out of the dryer ... but it's 100% cotton. Of course it will wrinkle. Does not bother me. My one complaint is that it does not have ties inside for the comforter. It's driving me crazy with the comforter shifting inside the cover! Others have suggested sewing your own in ... I think I will do that. Overall a soft, quality duvet cover with a great price. Enjoy ! Wonderful Duvet Set! Purchased Ivory, now back to buy another. These linens do need a "breaking in time" as is the case with most high TC bedding. They may need up to a dozen laundry cycles to feel how truly SOFT they are! Being Egyptian cotton the more you wash them, the softer (more comfortable) they become. Once "broken in" they provide yrs of durable, soft, luxurious bedding, they're an investment in your sleep, you'll never go back trust me. The wrinkling is minimal, laundering them according to recommendation is important, another trick is to place a tennis ball in the dryer with the duvet (old trick) it keeps it from "Balling up", remove, fold & stack nicely, this should smooth out most of the wrinkles, but it is cotton. I personally alternate my linens & touch up with an iron (not necessary), my bed always feels and looks BEAUTIFUL AND COMFORTABLE!!!!!! Worth the investment, (WHAT'S MORE IMPORTANT THAN OUR SLEEP!!) Good investment, will give yrs of luxury & comfort. Overstock is great, prices can't be beat, customer service is fab. Definitely would recommend!!! Both softness of the cotton and color are perfect. Bought this in white 3-4 years ago, and it has held up nicely. It has a nice, significant weight, and is really soft. In the summer, I use it without the duvet inside. I had purchased a different set that had a cool design on it, thinking I'd switch it up when I got bored of the plain white, but haven't wanted to because I like the way this one feels so much. I searched for quite a while & looked at a lot of different duvets before I purchased this one & am so happy with it. The color is perfect, the material is soft & comfortable & has a slight shine to is which makes it look nice. Very little wrinkles out of the bag & wears well. I am VERY happy with it & would highly recommend. You can't get a better value for the price & looks really nice. This duvet cover is very luxurious and very comfortable. The quality is good and has been durable over time. I purchased them for a good price and would say that this is a good value. These are amazing for the price! Great value! They get so soft with continued washing. I can’t believe how inexpensive they were for the quality. Not as good a quality as I had hoped. Super soft and very comfortable! Lovely color and is holding up well after many washings. Wonderful silky sateen feel. So happy to be able to get a duvet and sheets that match! Terrific quality. This is so soft! The color is true to the photo. It made a perfect addition to my bedroom. It is heavenly with my down comforter inside. Perfect for winter nesting! This is an excellent purchase! Really enjoy snuggling into this at night. It's warm in the winter, and cool in the summer. SO SOFT! It also holds up well to washing, and has stood the test of time. It is well made and has endured cats scratching and dog sleeping for the past eight years, and it is still in good shape. It feels smooth on skin too. I have nothing to complain about! A little too shiny but fabric is good and pale color is soothing. "I am looking at this, and 2 others you show, one with 1000, the other 650, all marked superior 100% cotton in Sage. I am looking for something soft, but durable. Is there a substancial difference in the three duvet covers.?" Different brands will may slightly differ in texture and quality. However, it is safe to say of that the higher thread count will generally be of better quality. "Does the duvet have a border. It appears so in the picture, or is it just the shams? Thank you"
The Superior Egyptian Cotton 800 Thread Count Solid Duvet Cover Set does not feature a border on the duvet cover. Due to the seam allowance, it reflects as a border around the pillow shams only. "is a duvet the same as a comforter ? is a duvet fluffy?" My favorite way to describe a duvet cover, is by saying it is a giant pillowcase for a comforter. Its slides over an comforter for a new look. "the queen sized cover is listed as being 88x92. Is this the actual cover size or the size that will fit an insert of size 88x92?" Yes redecorin, this is the size of the queen duvet cover: 88 inches x 92 inches. Thank you for your question. Please feel free to contact us again with any further questions. I bought it for a duvet that was 88x90 and it fit perfectly after I washed it. The duvet was listed as "extra warmth" so maybe it was a little thicker than normal. "Is it made by 100% egyptian cotton? I just saw in materials of 100% cotton, don't like other products was marked by 100% egyptian cotton." Unfortunately, this item is out of stock. We currently do not have inventory to check, and cannot guarantee the item will be restocked. Please feel free to check back with us periodically to see if the item has returned. "Does this cover have corner ties to hold your duvet in place?" Unfortunately, the duvet does not have corner ties. Thank you.